A version of this article was first published in Tradegood Viewpoints on January 2, 2015. Is the Asia Region’s Ad Hoc Approach to Trade Liberalization Coming to An End? Asia’s heyday of free trade agreements may have run its course. The emergence of two competing “mega-regional” trade deals — the Transpacific Partnership (TPP) and the Regional Comprehensive Economic Partnership (RCEP) – will likely make individual bilateral FTAs less attractive. The two deals also reflect the region’s long-held need to move beyond pure market access toward broader and deeper regulatory integration and a set of rules to harmonize investment and business climates. Whether these “mega-regionals” can lead Asia’s economies toward APEC’s ultimate goal of an Asia-wide free trade agreement, or instead, create two competing blocs, however, remains to be seen. The “Noodle Bowl” Effect: How Many FTAs Can Asia Handle? 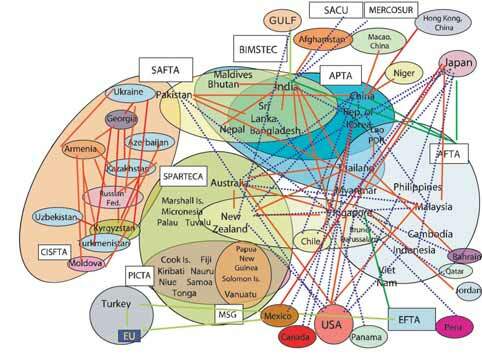 Whether you call it the “noodle bowl” effect or a confusing “alphabet soup,” Asia’s complicated network of individual, often overlapping FTAs is causing a major rethink in the region on how best to liberalize trade, speed up market access, and introduce regulatory convergence among the fastest growing economies in the world. The popularity of FTAs has largely been driven by the failure of the multilateral system to further open markets. After eight rounds of multilateral trade agreements under the GATT/WTO, high tariff peaks, trade restrictions, and behind-the-border measures are still the order of the day. With prospects for a new trade round having dimmed over the past several years, it’s only natural that Asia’s economies have turned to FTAs. But with over 75 individual free trade agreements now in operation among the region’s economies, their expanse and scope can be confounding. According to the Asian Development Bank’s Asia Regional Integration Center, Asia’s FTAs have exploded both within and beyond the region. For example, Singapore is party to 40 FTAs, Japan 27, China 29, Vietnam 27, and Thailand 30. Even Myanmar has joined 14 separate trade agreements. And while some of these FTAs make sense for political reasons or to open up specific sectors, the creation of this Asian “noodle bowl” is raising concerns among market players. Many businesses, for example, now see FTAs contributing to an increase in region-wide transaction costs, particularly for small and medium-sized enterprises that have to meet divergent rules for different FTA markets. As an illustration, they point to the multiple rules of origin (ROO) spread across the various FTAs as raising compliance costs and posing risks for enterprises that may run afoul of a country’s rules. Critics also argue that FTAs undermine the international trading architecture’s core principle of non-discrimination. They lead to costly trade diversion, make it harder for international businesses to operate efficiently, and provide powerful countries with an opportunity to extract controversial concessions from weaker trading partners on issues such as labor standards and intellectual property protection. This may be why “mega-regional” trade agreements, like the TPP and RCEP, have emerged as promising blueprints for addressing the increasingly fragmented architecture of individual trade agreements now dotting the Asia-Pacific landscape. According to a July 2014 World Economic Forum report, “mega-regionals” typically aim for deep integration partnerships between countries or regions with a major share of world trade and FDI, and in which two or more of the parties are in a paramount driver position, or serve as hubs, in global value chains. But how do the TPP and RCEP stack up and which is likely to be the vehicle to launch the region toward APEC’s goal of a full-fledged regional free trade area? The TPP has been much talked about and is best seen as a “WTO-plus approach.” This is because, in addition to breaking down barriers to trade in goods, services, and investment, it contains a much more demanding set of commitments, such as on IPR, labor standards, competition policy, investment rules, the environment, and the role of state-owned enterprises. These are clearly issues aimed at dealing with the economic challenges of the 21st century. 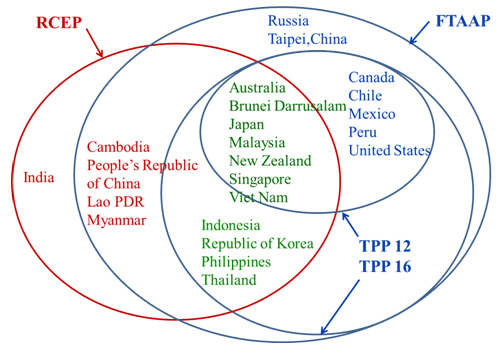 The TPP is currently composed of 12 members and excludes China. US-led, it aims to be completed by early 2015. Launched in 2012 with a target completion date of the end of 2015, the RCEP, on the other hand, includes the ten ASEAN members, plus its individual free trade partners China, Japan, and South Korea, as well as Australia, New Zealand and India. 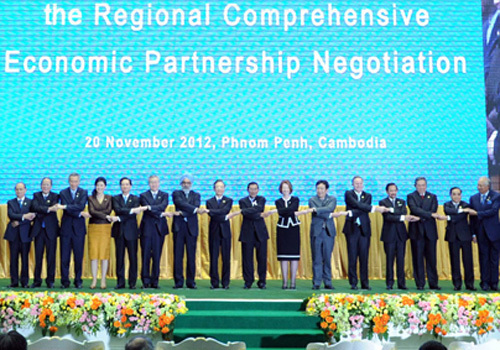 It is expected to incorporate all six of these “ASEAN + 1 FTAs” into an integrated regional framework. Unlike the more aggressive TPP, the RCEP, led by ASEAN and to a certain extent China, would be guided by the “ASEAN way” where objectives and commitments are driven by a consensus decision-making process. The RCEP is also expected to be more accommodative to the developmental differences of its members, which means more flexibility and adjusting mechanisms in reaching its goals. While it also aims to liberalize trade in goods, services, and investment, it will pay more attention to physical, institutional and people-to-people connectivity, narrow development gaps, and be designed to respond to new developments, such as emerging international production networks. Both agreements are comparable in size. According to the Asian Development Bank, the TPP countries account for 32% of the world’s GDP and 26% of global trade, while RCEP members make up 24% of world GDP and 28% of world trade. But these similarities hide important economic differences between the two, while also highlighting their members’ divergent interests. For example, average per capita GDP of the TPP area is over US$30,000. That of the RCEP is around US$5,800. The priority for developing countries in the region is to encourage trade in manufacturing and boost basic living standards. The TPP, in contrast, aims to expand market access in sectors where its members have a comparative advantage, such as services and investment. Despite these differences, both the TPP and RCEP should nevertheless give a major boost to world income. A recent Asia Development Bank Institute report highlighted that world income gains in 2025 from the TPP would be US$295 billion and from the RCEP US$644 billion. It also concluded that “region-wide FTAs offer more gains to world income than bilateral FTAs,” but that an eventual Free Trade Area of the Asia-Pacific (FTAAP) “offers notable gains over the RCEP and TPP,” in the amount of US$1.9 trillion by 2025. The big take away here for both the private sector and government policy makers is that, while individual bilateral FTAs may be popular or expedient, the success of regional economic integration and liberalization in Asia will greatly hinge on the effectiveness of the “mega-regionals” and whether they can eventually converge as building blocks for the big prize – a truly region-wide free trade agreement for all of the Asia-Pacific.